"My name is Joseph Klinitski and on June 11, 1993, I was involved in a motorcycle accident. I sustained a serious injury to my cervical area, and as a result suffer from compression of my spinal cord from C-4 to C-7. I was initially paralyzed from my neck down. Surgery was performed to stabilize two broken vertebrae at C-6 and C-7 and decompress my spinal cord. Unknown to me at the time, part of my spinal cord was left compressed At C-4 & C-5 by an incompetent neurosurgeon. From this surgery I regained some ability and I was able walk about 50 feet with crutches. Surgery was performed again, by a different neurosurgeon on Dec. 20, 1995 and my spinal cord was decompressed, and did experience some improvement. I could then walk about 150 - 200 feet, but with great difficulty. I was told nothing more could be done for me by the neurosurgeon, because of the length of time that my spinal cord was left compressed. Although seriously depressed, I refused to give up and accept the wheelchair I was confined to most of the time. My first visit to Dr. Sanet was in April of 1999. During this visit I demonstrated my abilities. When I walked with crutches my feet scissored and I stepped on my toes. I had to throw the right side of my body in order to move my right leg. My range was still about 200 feet maximum and I was still dealing with a great deal of spasms. My sleep was constantly interrupted by spasms for which I was on heavy medications. I had a limited range of movement with my arms. In most cases when my phone rang, I very seldom could answer it because of the spasms in my arms. Also if someone just brushed the side of my leg it would cause me to spasm and collapse. My hands where always closed in a fist and had to be pried open. After being pried open my hands would close to fist again in about 5 to 8 seconds. Performing basic hygiene and getting dressed was a nightmare. I rarely left my home. Life was hell. I started to see Dr. Sanet twice a week and began to feel improvement after about 12 weeks. Dr., Sanet worked on my entire body and his positive and optimistic attitude was a tremendous help, especially since the allopathic medical world had given up on me. Dr. Sanet inspired me to work on myself harder than I ever had before, and the result was amazing. I can’t medically explain the results of his treatment but after about 6 months I began to open my hands. After a year my hands opened completely whenever I wanted them to. My feet no longer scissored, and my gait and endurance improved as well. For the first time in years I slept at night. I answered my phone whenever wanted and life was getting better. I continued treatment with Dr. Sanet I was soon able to walk with crutches for more than a half mile. Last year I was reacquainted with a girl friend that I had not seen in 26 years. We got married this year and I have no doubt that one day I will dance with my bride. Thank you Dr. Sanet, Life is good." "After suffering from an automobile accident, I felt like a ninety year old person in the body of a thirty year old. For years I struggled with the simplest of task. Finally I took the advice of a family member who is a doctor and went to see Dr. Steven Sanet. After just a few treatments, he had me back to the condition I was prior to the accident. I learned from subsequent visits that most anything a family doctor can prescribe a drug for, Dr. Sanet can use osteopathic manipulation to allow my body to heal itself. I have and will continue to recommend countless friends and family to Dr. Steven Sanet." "I have been a patient of Dr. Steven Sanet for the past 12 Years after a cervical injury left me bedridden and with chronic migraines. The unrelenting pain left me with no will to live, as my quality of life was taken from me. After seeing many prominent physicians, too many to mention, their diagnoses left with me with no hope that I would ever be rid of this pain. Their only answer was to fill me with prescriptions that left me sedated on a daily basis. Being a Mom who did not want her children to see her this way, I decided not to take the toxic prescriptions, which did not even take my pain away. It was not until a very good friend suggested I take a chance and see a Doctor Steven Sanet, that my life turned around. After my initial consultation with Dr. Sanet, I began to have hope that finally someone was willing to help me, and who in fact, claimed he even could. Well, I am no longer bedridden, my migraines are so much fewer, and my children have their mother back. Dr. Sanet not only healed me, he healed my family. He has become a life long friend , whom we owe so much to. 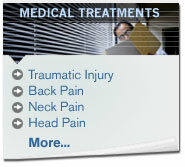 Dr. Sanet is a caring, loyal, and dedicated physician who will not give up until you are pain free. I would never go back to being treated with traditional medicine, where you are just a number, and given up on if your pain does not respond to "textbook" medicine. We are all unique individuals, whereas "one treatment does not fit all" and Dr. Sanet realizes this and takes the time to approach his patients individually with care. Thank you, Dr. Sanet, for taking my pain way and for giving me my life back." "My son Joey has cerebral palsy. He cannot walk, talk or feed himself. When I first brought him to see Dr. Sanet, he rarely slept through the night. The first change I noticed after about three visits was that Joey wasn't waking up 4 or 5 times a night, 5 days a week. He began sleeping through the night and would only occasionally wake up at night. I also began to notice that his eyes worked in sync more often than they did before. Joey's vision therapist noticed this too. His physical therapist couldn't believe the things he was starting to do. His head and trunk control improved, he could sit with very little support for short periods and he would even straighten himself to a standing position with very little assistance. He has even shown an interest in taking steps. But the biggest and most welcome change I see in my son is that he is more aware of what is going on around him. He is more responsive to conversations people have with him, and will even laugh in response to silly situations. I have been able to communicate with my son in ways I wasn't able to before." "For most of my life, I had back pain which sometimes radiated to my right leg. The pain was not always severe, and at times it was not present at all. My hips were not aligned, the right hip being higher than the left. This was quite evident by uneven hemlines. I also wore a 1/4-inch lift on the right shoe. I met Dr. Sanet when he was an intern at the hospital where I was working. My back was in an acute phase of pain at the time. I had heard from many staff members that Dr. Sanet could make me feel better, so I thought, "why not?" While he was treating me I remember thinking to myself, "This is a joke. He isn't doing anything," I thought. Was I ever wrong. When I got off the table I felt 100% better. Not only did his treatment help my pain, he was able to make me quite comfortable as well as align my hips. I have to admit that after my hips had been aligned, I was in severe pain. This was explained to me as the soft tissue, re-aligning itself. After two weeks the pain was gone." "For many years I had an irritable bowel problem. I went to see many doctors and had testing done. After the results the doctors would put me on drugs to control this problem. Drugs would help for a while and then the same problem would come back, even when I was taking the prescribed medications. So I thought that I would have to live with this condition. I started taking the prescribed medications and eventually started taking Immodium everyday. A friend of mine referred me to Dr. Sanet. When I had my first visit I was doubtful that he could help me. After about 4 to 6 weeks of treatment I could not believe it. My whole system changed for the better. I don't have to take Immodium like before, and I am so happy I gave these treatments a chance. I would refer my family and friends to Dr. Sanet. "For the last 27 years I have suffered from Chronic Neuralgia Syndrome (worse than a migraine). This was caused from a blow to the right side of the head. Surgery repaired the damage but left me with a lot of pain that would last for days, sometimes weeks on end. Throughout the years, the doctors I have seen and all of the medicines I have taken I've lost count. There have also been three other operations with only little relief. In June of 1998 I saw Dr. Sanet and after five weeks we started to get a change. The pain subsided for 3 to 4 days. Now we are up to 7 and 8 days of no pain. With the treatments I actually feel the fluid in my head more. I would suggest to anyone with chronic pain to see Dr. Sanet."